There's a lot of talk about inbound marketing. My last article on SEO Chat was specifically about it in fact. So lets first talk about what Inbound Marketing is, then how you do it to almost literally control search. In a nutshell, inbound marketing is the convergence of content marketing, social media marketing, and search engine optimization. Knowing what "inbound marketing" is does you no good if you don't know how to do it, or just as importantly why you should be doing it. Let me start by saying that if you're advertising I'm not suggesting that you should stop. What I am saying is that inbound marketing absolutely should be the focus of your marketing efforts. There is one overriding reason for this, one reason above others. 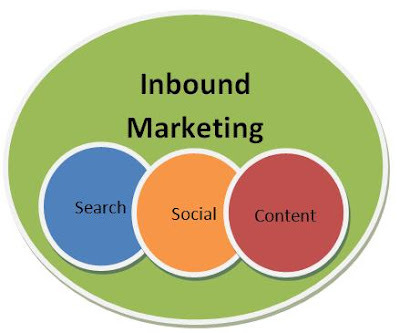 Inbound Marketing has, as its main focus, to make you an undisputed authority in your market. As an authority you have your pick of customers at the same time you charge more and have better profits. Inbound Marketing, once fully in place, can mean that you will no longer need to waste money on advertising because the best customers you can have are already seeking you out. More customers than you can handle will look for you without even considering if there is anyone else in your market. I explained what inbound marketing was and why you should be doing it, why it should be your focus, but there's more to explain before going into how it's done. Inbound marketing starts with content creation, sometimes referred to as content or article marketing. However, inbound marketing goes well beyond some of the inane article marketing strategies I've seen with taking crap articles and spinning them into more crap and putting them into even bigger crap article directories. The problem with those strategies is that you become associated with crap articles uploaded to crap article directories that almost no one actually uses. Inbound marketing starts with the creation of great content that goes beyond the 500 word length junk most people produce. That content is then placed onto your blog and shared through social media. If your content actually is great then you will find that the social sharing will spread out. People will further share your content out which means top search rankings. Additionally, the constant addition of detailed, in depth content for your market will also mean an overwhelming possibility of top search rankings. Google likes new, fresh content and ranks sites well that regularly post new things. In other words, over time, Google itself will see you as the authority in your market and for that reason automatically give you good rankings. Not only that, but between the sharing, multiple top search rankings, and great content, customers will be much more inclined to do business with you over anyone else because you'll be the only person in the market actually answering questions. Start a blog for your company. If you have one, understand that a blog is not simply some mechanism for company press releases or milk toast about products. If you don't have a blog let me highly recommend using wordpress. Use the Google Keyword Tool to find out what questions customers are asking. (add what, how, why, and when to relevant key phrases to your market) .Take every question that any customer has asked either on search that you found or that has been asked to your sales or customer service teams, and create content around it and post that to your blog. Share on Google+, Facebook, Twitter, Delicious, Reddit, Digg, and every other social network. Create content on things your customers should know and share that content as well. Do product comparisons to help your customers out ... in depth, detailed comparisons and give your opinion as to which product is better and why. Give your opinions on anything and everything going on in your market. Find forums relating to your market and engage in conversations there. Find people on the social media sites talking about your market, especially Google+ and Facebook and engage in those conversations. In a nutshell, that's all there is to it. While that may seem like there isn't much there, the truth is that those seven steps constitute something incredible. Something that can allow you to be the top player in your market very quickly. They constitute your ability to demonstrate an overwhelming expertise in your market that no one else can hope to over come. Preciously few markets have anyone in them doing anything like the above. You can be the undisputed local market authority with all the customers you can handle. That authority translates not only to more customers, it translates to the best customers that will pay you more just for the privilege of doing business with you. I came across your website site through blogger link up. I like what you are doing here in this article is exceptionally good for anyone who does not know what inbound marketing is. I personally had never heard the term before, but now that this article has explained it for me I know exactly what it is and that I have been doing it for years. One thing I want point out is that no matter how huge your audience is social media campaigns only rely on word-of-mouth. Which means that your content has to be top-notch in order for people to like and share it.